The global environmental status is scientifically proven to be increasingly threatened by climate destabilization, and renewable energy plays a pivotal role in helping in bringing balance to the ecosystem as well as human economies. 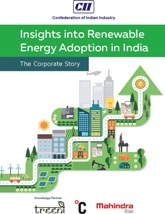 The report examines the challenges and opportunities for corporate and non-corporate entities to participate effectively in constructing a 100% renewable energy society. As part of this study, a survey was devised to elicit the insights and insecurities of professionals and experts who are exploring renewable energy investment and adoption. A realistic picture of the existing policies and technologies was developed to help corporations assess the gap between their present state and a potential RE100 scenario.